In concert with Söderköpings Gästabud there is a very popular contest being held. 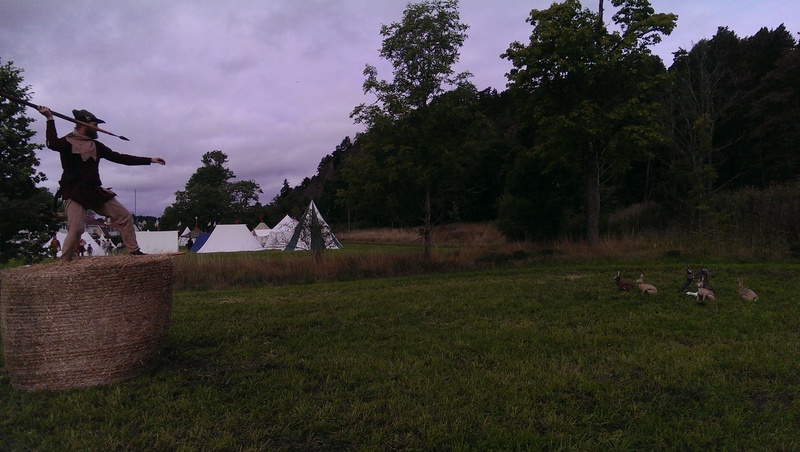 This is the ‘Yngve Trötts Bågskyttetävling” (Yngve The Tireds archer-competition). This year it had opened up to all medieval projectiles (maybe it was before, but this year it was pronounced). The competition is in the form of a hunt-trail. 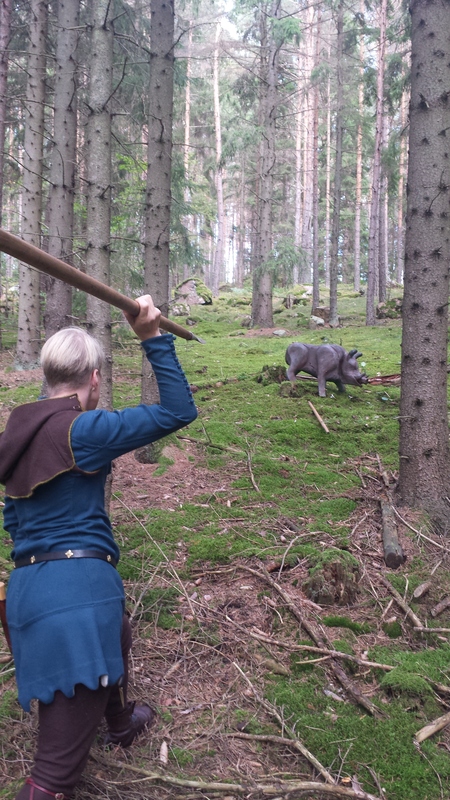 It is therefore, to my knowledge the only big event actually doing ‘medieval hunting’ in Sweden. It is a very popular competition, having 60 participators from the whole of Europe. Some even travelled here from Iceland, and it usually takes a lot to lure the Icelanders of their island. So, me and Emil, of course, had no other choice but to pack our javelins and sally forth to glory and odd animal-hunting! We travelled light, only carrying what was needed and hoping to get covered by our friends tents in case of rain. The Town of Söderköping is very old, the street of Vintervadsgatan having had the same stretch for 1000 years. It was once a centre of commerce in the area of Östergötland (Eastgothia). 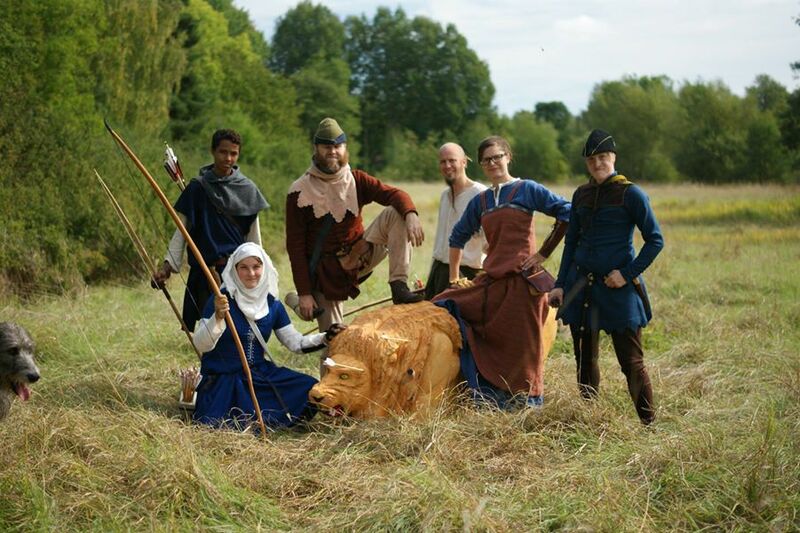 Our six man group: Annie, Suleyman, Johan, Martin, Miriam and Emil. Boudica is photobombing, as usual. But, back to the event. 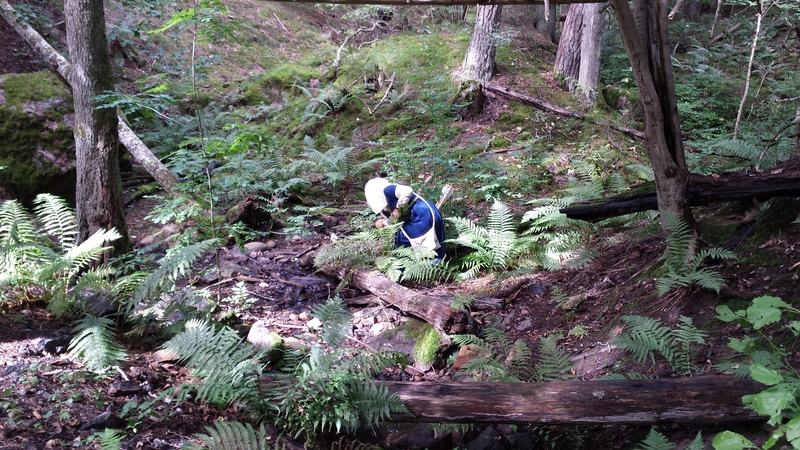 The hunt-trail consisted of 22 targets in rather steep terrain. We went out around 10 in the morning and was not back until 5 hours later. We where divided into groups of about 5 or 6. Me and Emil was the only ones not using a bow. We didn’t really have any expectations of getting any points that would put us in the upper field of the points-roosters as the course was set for bows and not javelins. But we did get the permission to go closer if needed when the distance was to long. At each target you fired two missiles. If you hit it with the first one, you got ten points. If you missed and hit it with the second, five. So you could get ten, five or zero points on each target (some had special rules…). The weapons had to be medieval in both design and making and so was the archers clothes and other gear (or.. in many cases.. medieval-ish) . The missiles had to stick to the target, they where not to fall off OR to go straight through. Other than that, it was just hit or miss that counted. Where you hit it was of no interest. After that, came the searching of arrows…. 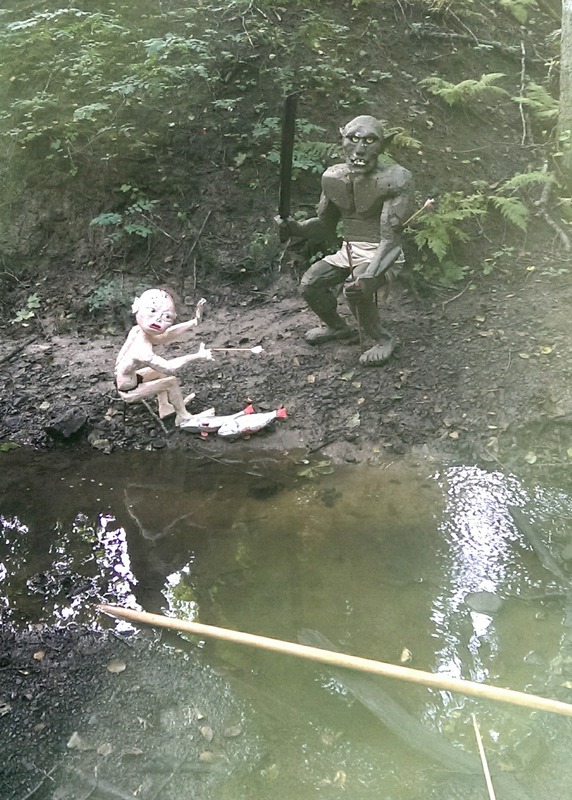 Gollum, his fishes and an orc stealing them! Emils spear in the stream missed the party. During the years this competition have had some different themes. This was reflected by the plethora of diverse targets we encountered out on the trail. There where some regular boring animals, like badgers and boars, but also Drollerie animals in the style of the Lutrellpsalter and good old favourites like the killer rabbit from Monty Python and Lord of the Rings characters. Our apprehension about the distance to the targets where soon abated. The targets where often well inside javelin-distance, and especially if you got to move a bit so you got the steadier footing needed to throw. We did not move more then absolutely necessary to be able to throw though. 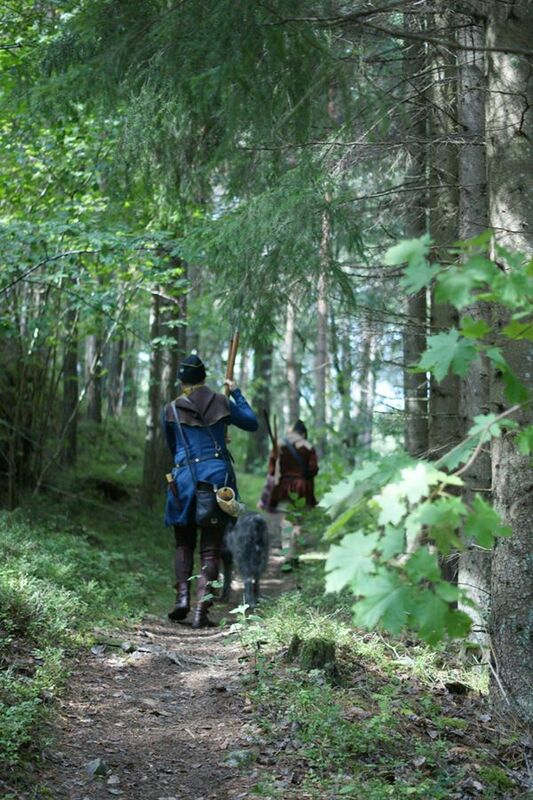 Making the long distances for the archers, very long distances for javelins. But sometimes we had to cut the distance in half just to have a chance to be able to throw at all. Some, like a shot over the canal, was not even to think about. 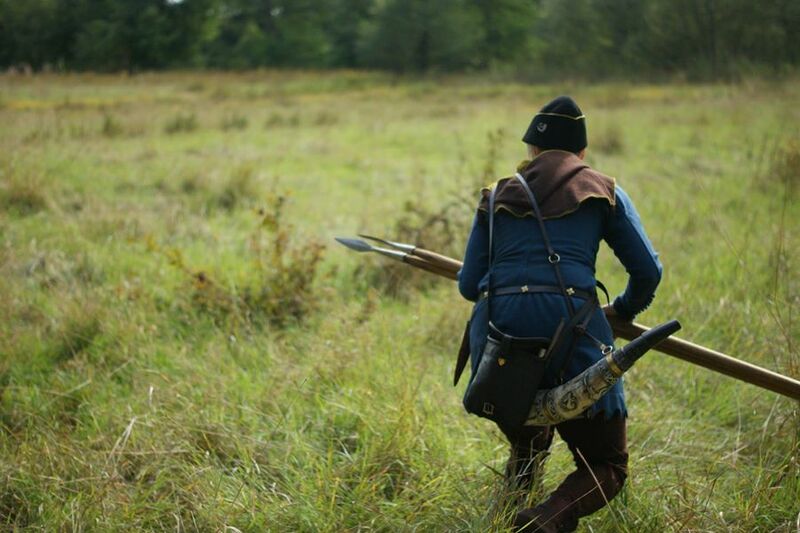 But in general, I think that the targets were well placed and that we had a decent chance to partake with our javelins. Some targets where even easier with javelin than bow, so I guess it kinda evened out a bit. We mostly throw javelin in the best conditions. Level ground, we choose the distance, the target is not obscured. Throwing it in the field is something else. The ground was never even, it was always uphill or downhill. Sometimes even so steep you where throwing from above the targets. The footing was perilous and there where seldom room to throw with the whole body. It was a very good experience, and very educating. I found myself over and over thinking “what did I just do? That’s not how you throw a javelin”. And then I did it again… and again. One might say I was a bit off my game and one might be right. That I had just re-shafted the spears and not had time to practise with them before I started might also count into the mix… But these are excuses, the sad truth is that I SHOULD have hit several more targets then I did. I just wasn’t good enough. Most throws went low and short. Probably I tried to throw AT the target when I had to adjust for distance and aim ABOVE. This is something I learned for one thing. I also learned that bows are vastly superior as hunt-weapons compared to javelins, and this helped me to convince me that my theory about its uses holds water, so far. The targets where handmade from the same things floaters for swimming pools are made of (like poolnoodles and their flat compadres of the water) and then coated and painted. They where very good and sturdy for targets. The range was, as said before very imaginative and fun to see, giving the whole event a loose and fun atmosphere. 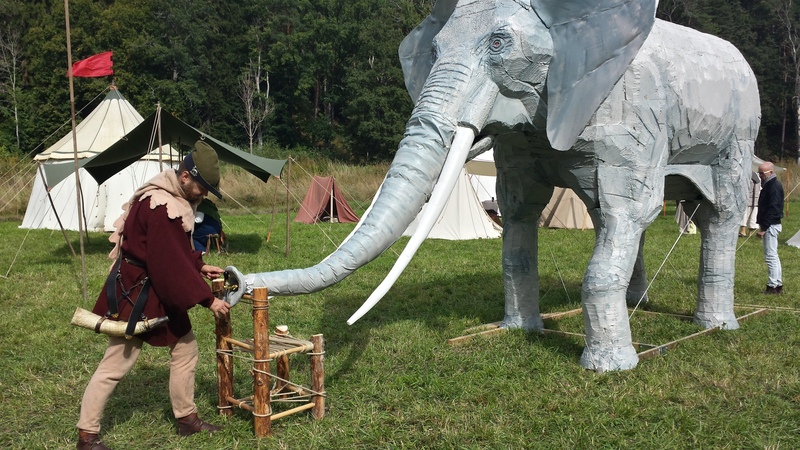 After the competitions the elephant was taken into the camp and had, of course, its trunk turned into a beer hose. Just like they would have done in 14:the cent. 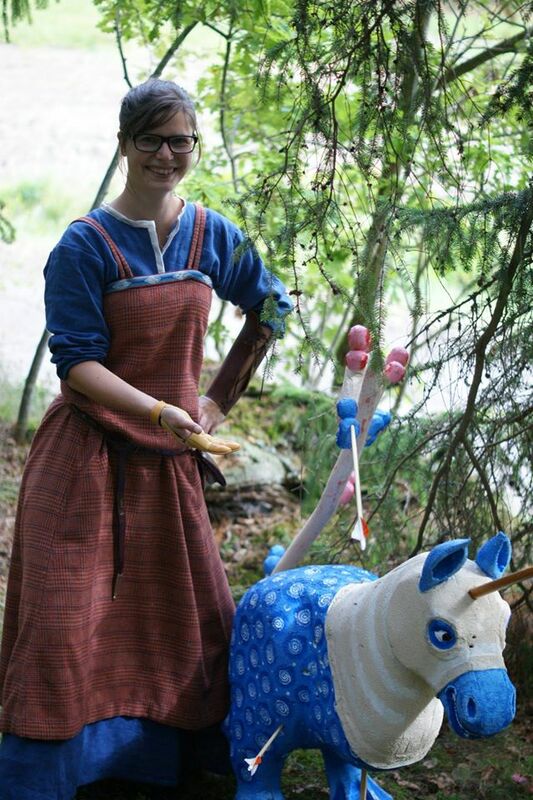 Fieldrabbittarget. All rabbits that fell down counted for 5 points. But if you hit Gerorge the ermine, you got zero. We think it was a very well run event. Even if we, lazy buggers that we are, had not given much effort to gather information, we easily got in on everything and got all the information we needed, when we needed it. Its not easy to have 60 people running around in the woods shooting at stuff, but the group system (that built on trust, as each group counted their own points) worked very well. Clumping together of groups is usual in these things, but it rarely happened once the filed was getting spread out over the trail. The targets was smart, fun and well placed. The difficulty seemed well-balanced and the special targets (moving ones, special rules ones and so on) added spice so it did not get repetitive. The organisers was very friendly and welcoming. You really felt that they where glad to have you there, this also set an atmosphere of fun and of not taking things to seriously, witch is always refreshing in competitive events. The best got 220 points. I got 45.